Today’s story teller is chairperson of [W:TOTO Ltd.], Teruo Kise. The story was about “abacus”, which is the first thing that comes up to his mind as his memento. 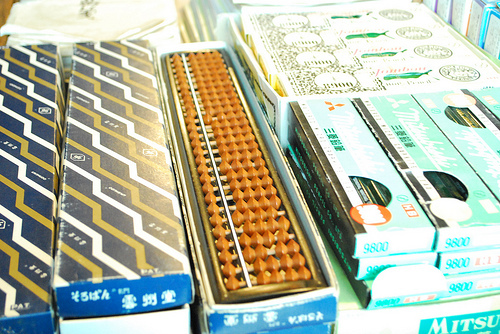 He first started learning abacus when he was in elementary school. Although he didn’t get high rank, it was the most useful skill to him. He entered TOTO in 1970, when [W:Japan World Exposition] was held in Osaka, and Japan’s economy was picking up in the “post-war economic miracle”. Assigned at the budget department, he used to discuss all day with the board members, but sometimes they couldn’t come to a conclusion, and furthermore, he was told “the numbers have changed” and had to correct them till morning. Struggling at the budget department, he couldn’t get any day off for half a year; his eye sight got poor and he started wearing glasses. After calculators spread, his work got quite soft, but Kise doesn’t think of the golden age of calculators and pc so positively.